If you have a little girl in your life you will want to continue reading on and entering to win an amazing American Girl doll to make their day! I love the life like variety of accessories that are available with AGD. I love that Blair looks innocent and modest. She is not made up with fancy clothes or makeup. Simple and sweet…. Perfect! I really love the adorable outfits and accessories they have to offer for the american girl dolls!! So stylish. I like that they’re good role model dolls for kids to play with; they’re not like Bratz or some trashy doll. And their stories are sweet and imaginative. They seem, just, pure? If that makes sense, lol. I really like the high quality intricate attention to detail that American Girl offers in their product line of dolls. I like the history you learn . I like that blair lives on a farm . I would keep this if I win . I like the American girl dolls because they have interesting & educational stories. I like Blaire because of her farming background. I also think she is pretty. I would share her with one of my 2 granddaughters. Blaire is so cute, love the red hair. My granddaughter would love her. Blaire is such a cute doll. I like the quality of the AG products and the attention to detail! Blaire’s shoes are adorable! I would love to surprise my daughter with this doll. Blaire is so adorable. My daughter would love to own her. share this with my niece. I like the doll’s image. I would give her to my niece. I think the American Girl dolls are very high quality. They would last a little girl her lifetime! give this doll to her 5 year old who likes gardening and animals of all kinds. 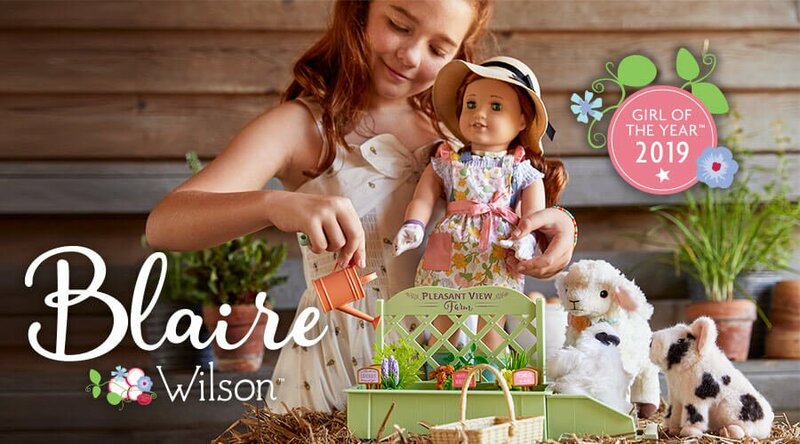 Blaire is a beautiful doll, just like all the other American Girl dolls are. I love all their outfits, too! My granddaughter would love this one. Thanks! The American Girl dolls remind me of my childhood! I would share this with my boyfriend’s little baby cousin so she can play with it throughout the years!